At O’Reilly’s Emerging Technologies conference two weeks ago, one of the big topics was building community, and that building community meant letting passionate community members tinker under the hood. I found it ironic that at such a conference the hotel piano was off-limits. It had a big sign on it saying “Please refrain from playing”. In fact, it isn’t just off-limits, it’s hidden away from any place people might congregate: behind the stairs on the long way around to the men’s restroom. On the home front, I was recently reminded of a story by Garrison Keillor that I heard a long time ago on Prairie Home Companion. Many farmers who install electric fences to keep the cows in find that the fences are expensive and time-consuming to maintain. Eventually, the fence shorts out or the power dies and the farmer doesn’t bother to restore electricity to it. They don’t need to. The cows have learned not to touch the fences. My somewhat limited experience on farms is that this is true: most of the time, the electric fence is not turned on. Keillor ended his story by urging the cows to escape: Cows! The electric fence is turned off! Be free! This may seem like a strange segue, but bear with me. I’ve long been mildly annoyed by our continued use of mousepads long after we’ve switched to optical mice and new, smooth, hard surfaces for the computers. The mousepads provide no useful surface: they don’t keep the balls clean, there are no balls on optical mice. For that matter, most of the mousepads are dirtier than the surface of the table they’re on. 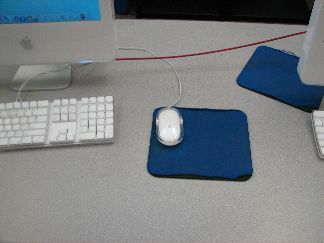 The cloth mousepads attract dirt like crazy, but the table surface is easily wiped clean, and is cleaned regularly. 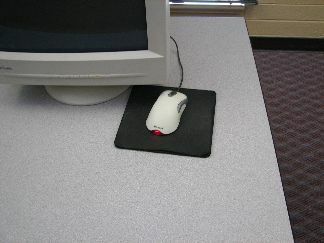 All that mousepads do for us nowadays is severely limit the available surface for using the mouse. It isn’t a big deal for me; I always just move the mousepad to the back of the table and use the table surface. But most of the students using our labs assume that we put the mousepads there because they’re useful, and try to use them. Kindergarten taught them to color within the lines and that lesson carries over. For the Mac users it isn’t that big of a deal even then, because the Macintosh mouse is a sleek, relatively small device. If anything it has become smaller over the years. Windows mice, on the other hand, have been growing wider, taller, and longer. A week ago, after returning from ETech, I was working on one of the lab computers and as I was moving the mousepad off to the side I happened to look over at the Windows side of the room. Their mice have grown to about a quarter the size of the mousepad. They’re fat little slugs that barely fit within their invisible walls. Mice! The mousepad no longer confines you! Be free! This “No Second Chances” blog engine was fun to write during spare time at ETech 2007. Snakelets appears to be a useful Python webapp server if you need a webapp server immediately. O’Reilly’s Emerging Technologies conference is always interesting; this year seemed a little more commercial than previous ones with a little more of an emphasis on technology that’s already here, but was still fascinating despite that. In honor of ETech 2005 I’ve just added a new category for computer programming snippets and other computer-related hacks. Losing and missing the point last modified May 25th, 2009.